You are at the right place, this class is for you! Sādhanā literally “a means of accomplishing something”, it is a sanskrit word that invokes the energy of dedication, transformation, discipline and wisdom for a higher purpose. This unique Yoga class offers in depth practices that you don’t usually experience in casual standard Yoga classes. 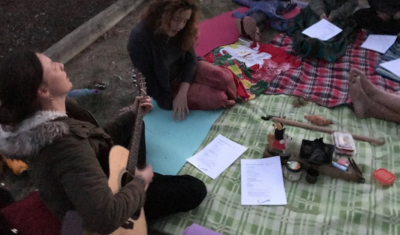 This slot will have a particular focus on restoring our nervous system with restoratives, deepening our connection with Self and promoting healing using sounds. This course involves the use of bolsters and props for restoratives that will reset your nervous system and para sympathetic nervous system. You will also experience some gentle yoga that enlivens mindfulness while as loosening up the body. This course also involves meditative practices with sounds, breath and mantra as well as live music to some sessions. The mantras and sounds we use are specifically designed to re-harmonize our chakra system and promote vibrational healing. Hatha Yoga, Laya yoga, Bhakti Yoga, Nada Yoga, Yin Yoga and meditation in a coherent, progressive and safe way. When you join this course, you are in for your own fast track transformation! My name is Nandini, I started Yoga when I was 14 in my home land Tahiti. I was asked to teach yoga by an Indian Yoga Master Shri Mahesh when I was 19. I have been passionate about practicing and teaching Yoga up till now.. some 21 years later. I am dedicated, versatile and creative in my approach. 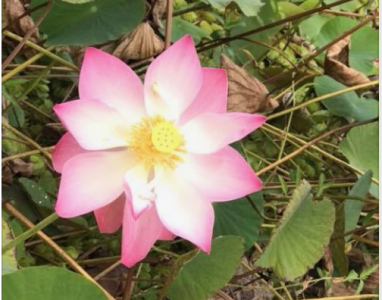 My intention is to bring you to a place of deep connectedness and ease as you explore your own unique Yoga journey so that you can feel amazing and thrive. I also have a passion for all that is sacred and for Feminine Awakening (feel free to explore my website for more). I have trained with highly regarded teachers like Donna Farhi, Kieran O’Callaghan, Chameli Ardagh, Lisa Shrader. I have also been exposed to practices and wisdom from many traditions and teachers like Maharishi Mahesh Yogi, Ramana Maharishi, Mata Amritanandamayi , Ananda Mayi Ma , Yengar, Shivananda, Satyananda, Yogananda and many others. This class is open to both Men and Women, every Tuesday. I had a crappy day today, things not how I want them to be. Me not as I want me to be. Then I went to yoga (Sadhana). The fogginess turned to clarity. I had a transformative meditation experience, and felt myself connect to the oneness of us all, and everything else fell away. My mind stilled. I let go of all of my ideas, my thoughts and i just felt. I felt my body filled with electric lightness. At the end of the meditation I had a vision. I’ve not had an experience like this for a long time! Thank you Nandini love your teaching! Thank you so much Nandini! 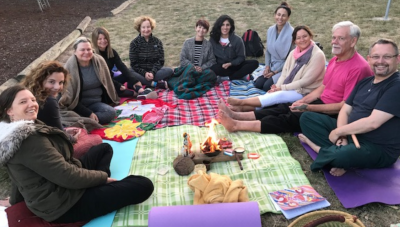 it was a wonderful course overall – introducing me to lots of new yoga ways. I loved the chanting so much and have been mediating on the chants every day! The bells tonight were magical too! Thank you for being the lovely gentle person you are and making me feel so welcome in your class. I have stopped searching and then again I was looking for where my heart and soul would feel comfort, this way I could journey in my truth.. I must say with Nandini facilitating and being there at each moment for us as a group found myself where there was no judgement only guidance and heart love as this was expressed, I was overwhelmed at times as my calling became clear. Nandini holds the class in pure integrity with kindness as she genly and firmly touches our journey so we may be who we truly are, there was also laughter.. Photos from the Sadhana Course. 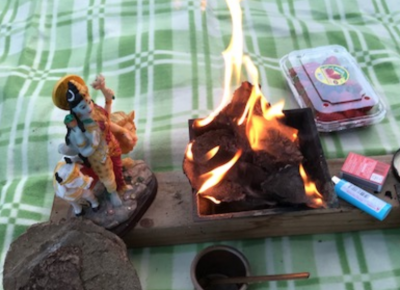 We performed a fire ceremony on our completion day.